I believe that instagram has a huge power of connecting you with places, people and talents you didn’t know before. Ofcourse when you do some research online you can find new hotspots or places to go at other blogs or community sites. But on instagram you’re able to get a little experience already before you actually have been there. 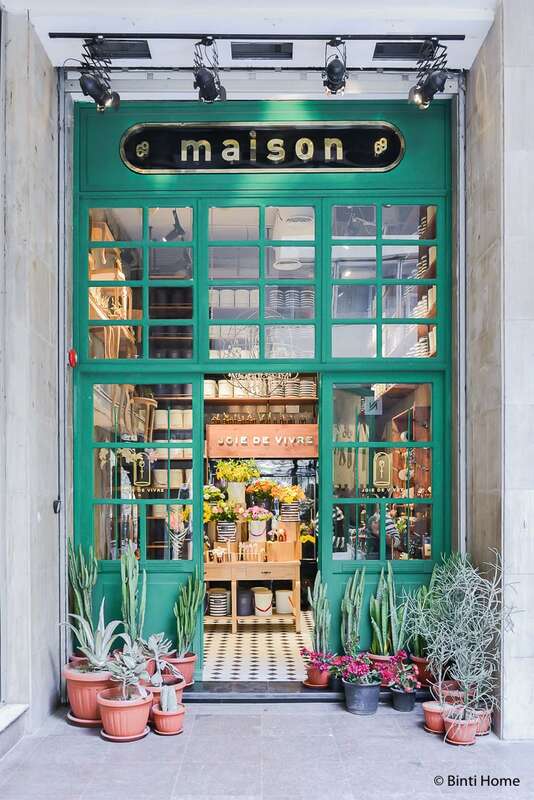 And that what made me so curious earlier this week when I saw some snaps of Maison69, a new conceptstore in Zamalek. Flowers always makes me happy, I can’t live without them. Its a bit dramatic maybe but they always put a smile on my face. Like I wrote down in the blogpost from last wednesday about the Urban Jungle, also a must have at home. I believe that bringing nature indoors gives your home a pure, lively and colourful atmosphere. And what I love about flowers is that there are so many variaties in shape, size and colours. And even more beautiful, flowers have a symbolic meaning too. 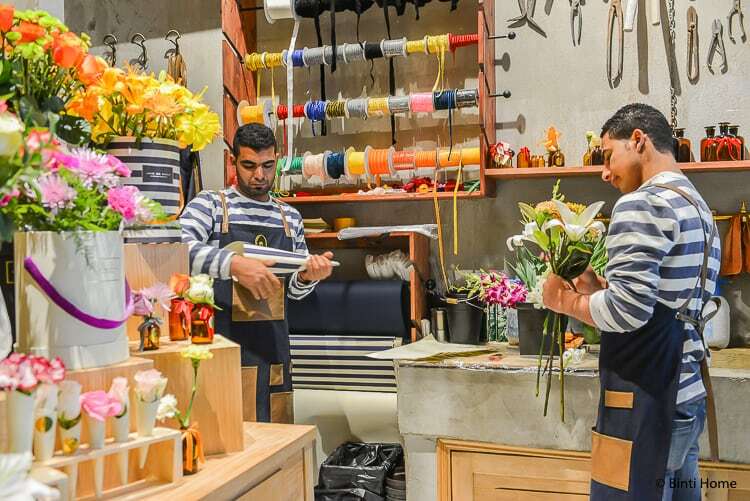 In Zamalek you have different flower shops on the corners of the streets. It’s a colourful bunch of flowers in the middle of the busy streets or Cairo. When I decided that I had to visit Maison69 I didn’t know what to expect. The photo’s on instagram already looked great but I couldn’t really imagine how big the store was. It started with these big green doors with pretty plants on each sides. 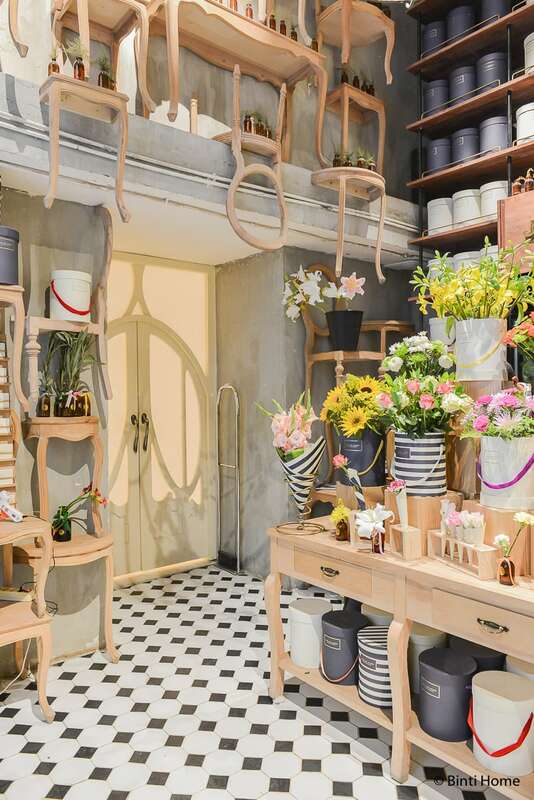 A beautiful entrance for this amazing new conceptstore experience in Cairo. When I enter this petit store I was looking around like, wow! The design of the store is different than I have seen before here in Cairo. 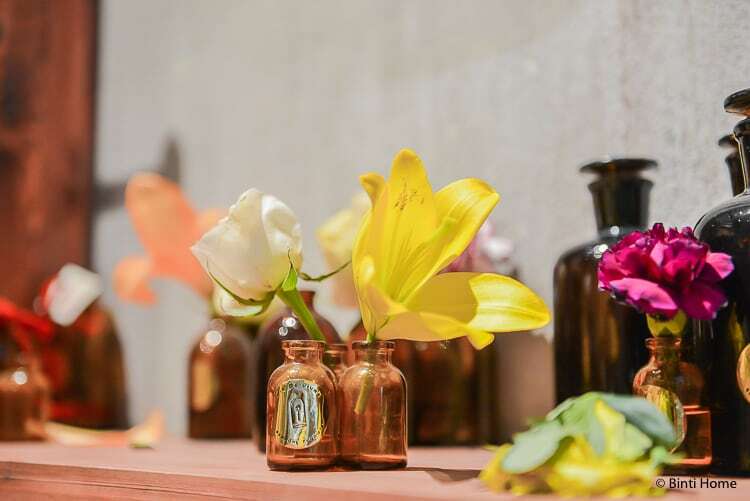 It’s more than just a flower shop but a complete flower experience. 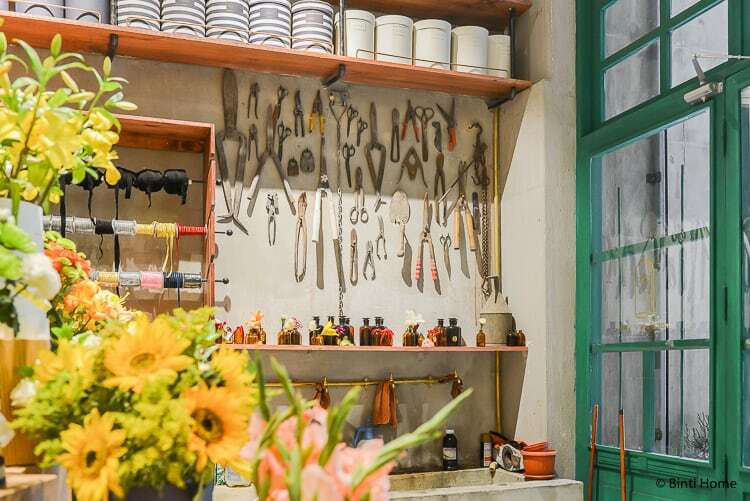 From picking the flowers from the cooler in the back, cutting tools for preparing the flowers and even the display looks great. 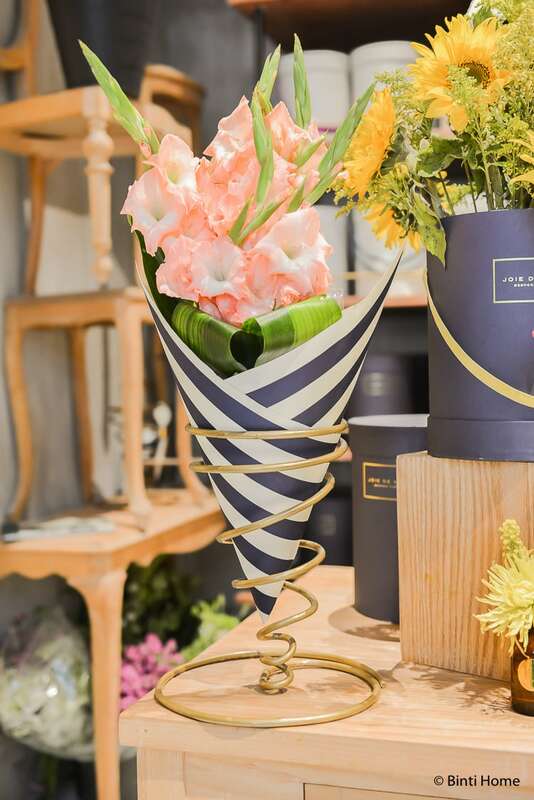 You can choose for different ways of wrapping your bouquet, thinking about a pretty gift box or a cone shape from blue/white stripped wrapping paper. 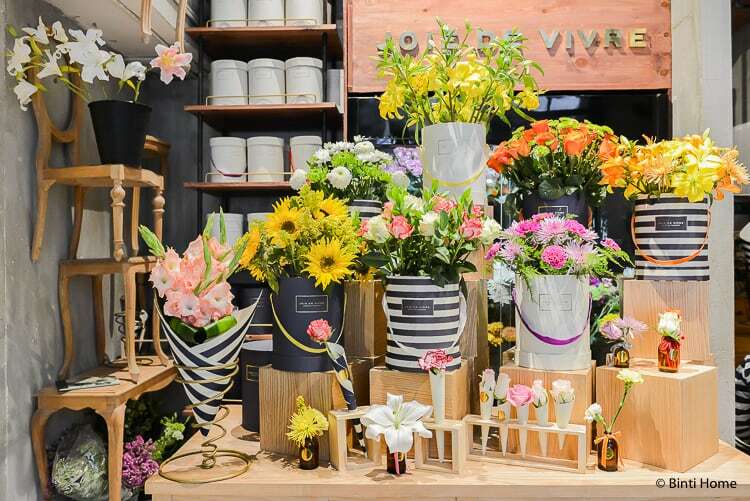 In different corners in the store you can find stylingideas for flowers. 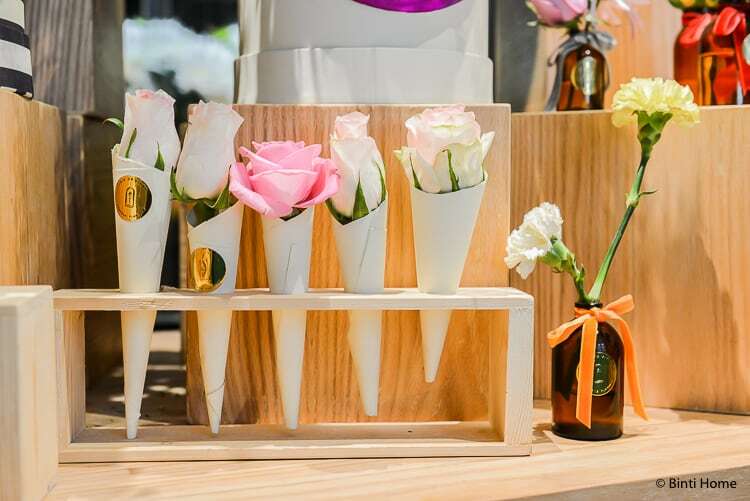 Thinking about small vases where you can put one single flower in but also little cones in a wooden tray is a perfect gift! I have to say that the wrapping boxes are amazing and you can even re-use it for storage decoration at home. What I like the best about a flower shop when I am able to pick the flowers myself. 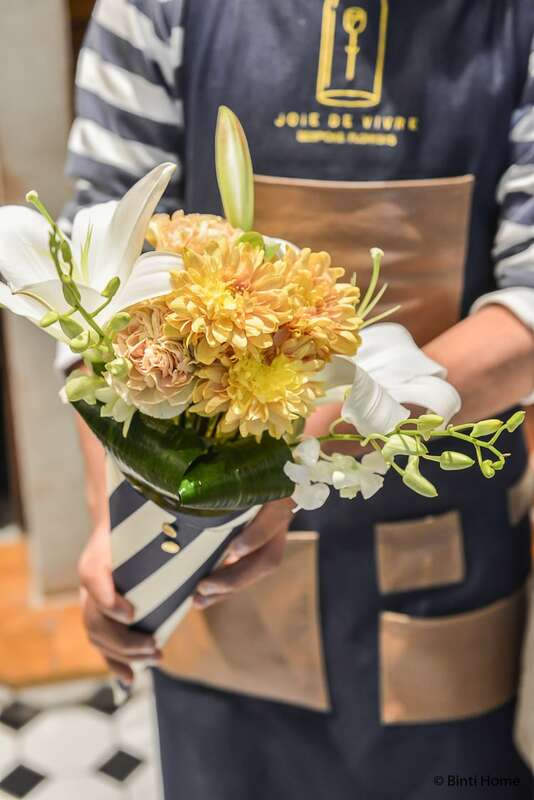 In this way I can create my own personal bouquet. I have visited some stores before where I was only able to buy a ready made bouquet or a minimum amount of the flower I wanted. But personalizing your orders has become so important these days. So a plus for Joie de Vivre that they let you decide yourself! So after I have picked my flowers from the cooling box and the guys started to wrap the flowers I made some more photo’s in the store. Then the cute cards caught my eye, white wild gold ( can it be better?! ), with nice quotes. I believe that they have thought about anything in this store. Even the two guys wear striped shirts with a cool apron over it. I love it when a brand offers a complete experience. 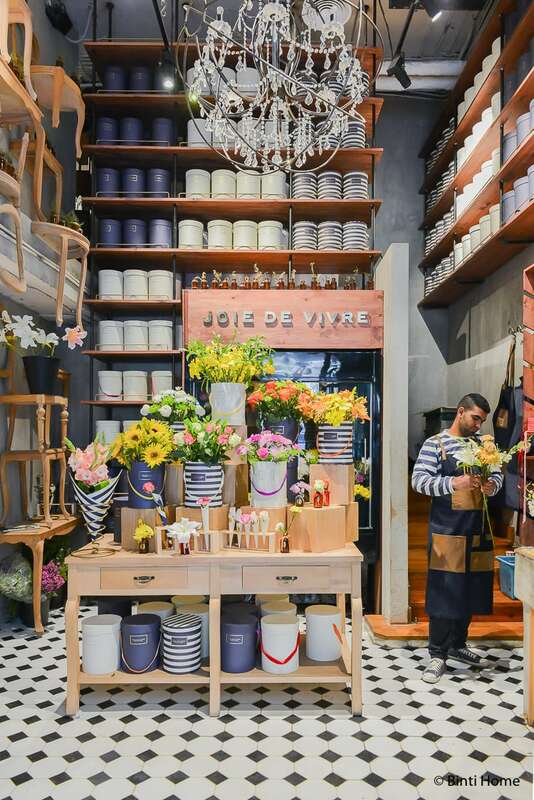 A big yaay for Joie de Vivre! This pretty personal bouquet is coming home with me. In the next blogpost I will show you how they look in our home! Hi Geri, ja dat vond ik dus ook, de entrance is al super! Ja mooi he! Ben er helemaal weg van en dat hier in Cairo! Echt een fijne vondst!